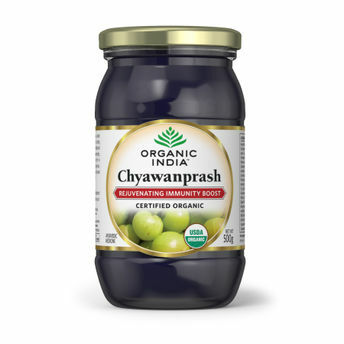 Organic Chyawanprash helps in strengthening the immune system. Nourishes the brain cells and enhances memory power, increases retention and recall. Helps purify blood and alleviates cough and asthma. It is good for heart. Improves skin complexion and glow. Helps strengthens digestion, absorption and assimilation of food by improving liver function. Acts against the ageing process and maintain youthfulness. Promotes hair growth and helps absorption of calcium resulting in strong bones and teeth. It provides required nutrients and minerals for health care.